Zynga on Wednesday announced that it had acquired OMGPop, the company behind the insanely popular Draw Something ( ) app. All Things Digital, which cites “people with first-hand knowledge,” pegs the purchase price around $200 million. 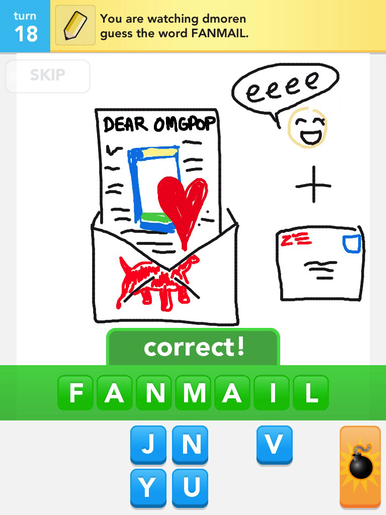 Macworld staff editor Serenity Caldwell drew this depiction of Zynga’s Draw Something courting process. Draw Something, which All Things Digital says has been earning $250,000 per day after Apple’s cut—is a turn-based, Pictionary-style game. The game is currently the top paid app in the App Store. Though not a word game per se, the game certainly fits in with others on Zynga’s roster, such as Words With Friends, Hanging With Friends, and Scramble With Friends; all three—like Draw Something—are two-player asynchronous friendly guessing games. David Ko, Zynga’s Chief Mobile Officer, described OMGPop as “an awesome developer and publisher of games,” declaring that OMGPop’s strategy echoes “our mission of connecting the world through games.” Ko said that OMGPop makes more than 35 casual multiplayer games, though obviously Draw Something is the most popular. The game—just six weeks old—has been downloaded more than 35 million times, Ko said. Even more jaw-dropping: “In the past week, more than one billion drawings have been made” in the game, he said. OMGPop CEO Dan Porter will now serve as the vice president and general manager of Zynga New York, Ko said. He added that the entire Zynga team was “ecstatic and thrilled” by the OMGPop acquisition. Zynga initially rose to fame—and wealth—with Facebook-dominating games like FarmVille, FrontierVille, FishVille, and PetVille. The company acquired Words With Friends developer Newtoy in December 2010, getting games Chess With Friends and We Rule in the process. Updated 3:27 p.m. ET with details from the Zynga press conference.